I’ve just come back from a week in the Isle of Wight with my husband and 2 young boys. I’ve been swimming in the sea and the outdoor pool, sunbathing, eating al fresco, and at times, I did have to remind myself that I was still in the UK rather than in the Med somewhere. 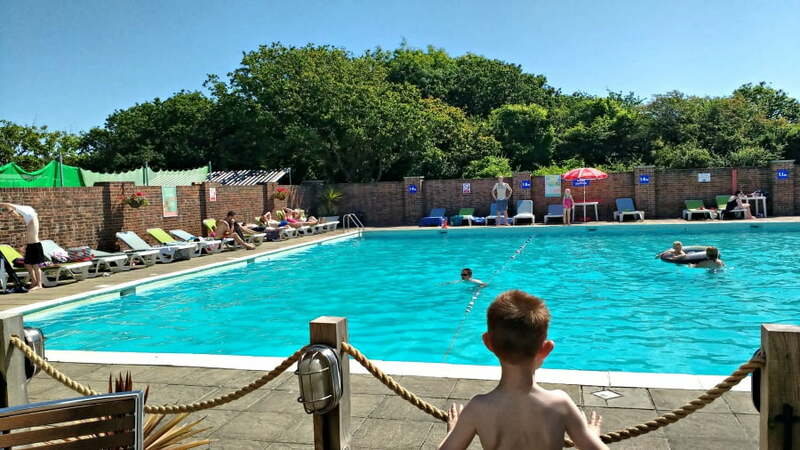 We stayed at Away Resort’s Whitecliff Bay, which is a great place for families looking for a baby or toddler friendly holiday park in the Isle of Wight. 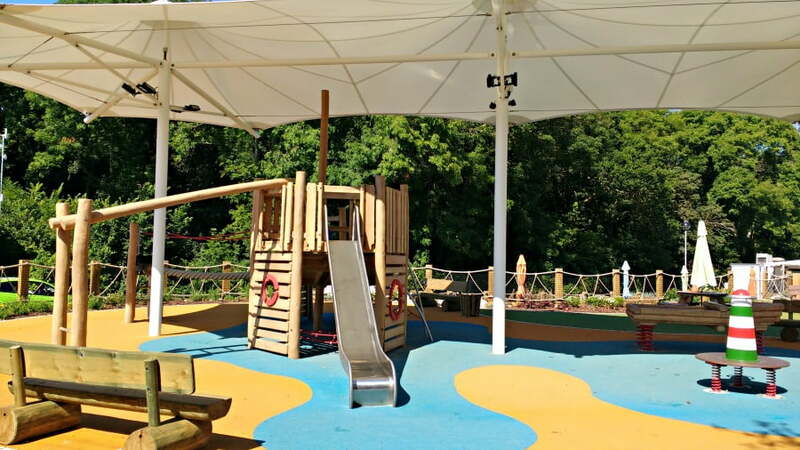 Recently refurbished, Whitecliff Bay offers loads of facilities for kids including 2 playgrounds, an indoor and outdoor swimming pool, onsite entertainment – and best of all its own private beach. 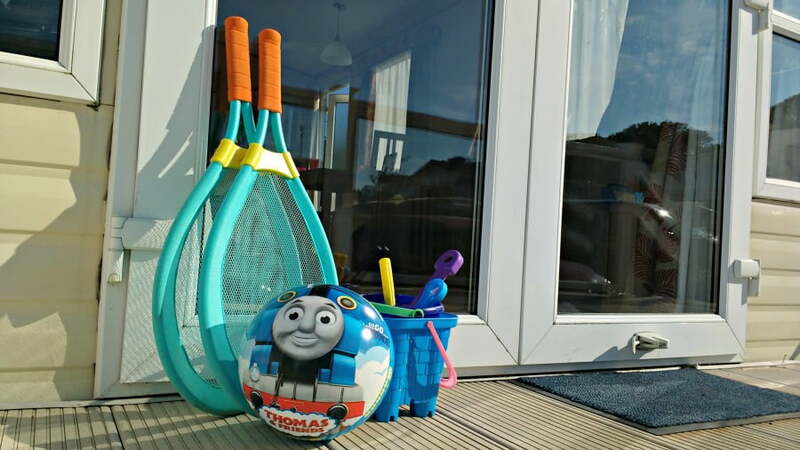 Read on to find out why I would recommend Whitecliff Bay to families with young children. 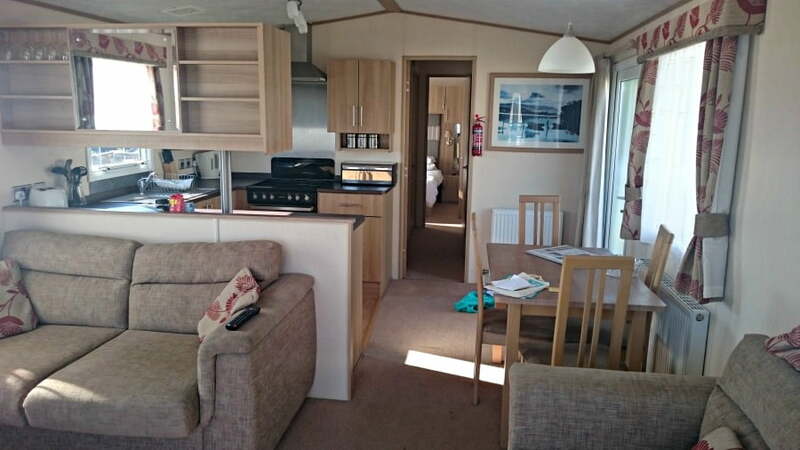 We stayed in a luxury caravan which had 2 bedrooms, 2 bathrooms, an open plan living / dining area and a well-equipped kitchen. There was a TV and DVD player in the sitting room as well as a flat screen TV in the main bedroom. There was a little terrace outside which was great for playing on. The welcome pack was a nice surprise, because as well as all the essentials such as tea, coffee, milk, washing up liquid etc, there was also some goodies such as beer, wine, chocolate, marshmallows and Fruit Shoots for the boys. It was just what we needed after a long journey. Cots, highchairs and bed guards are available to book for a £10 per week charge. Plastic crockery and cutlery were available in the cupboards. 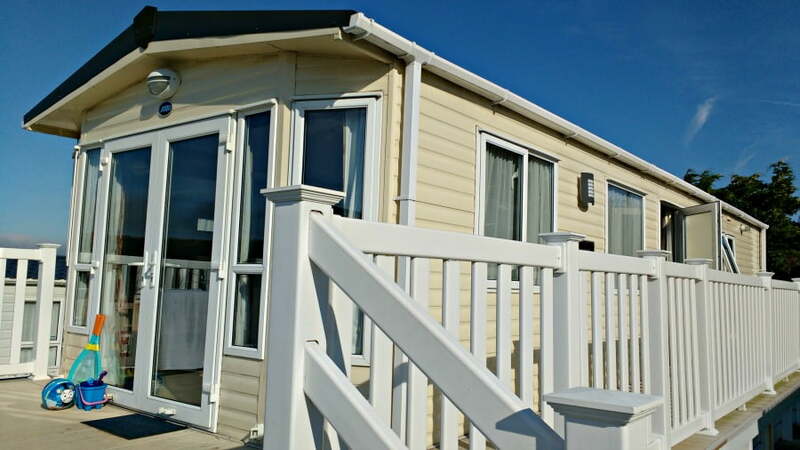 Other Accommodation Options – If you don’t fancy staying in a caravan at Whitecliff Bay, there also lodges and chalets as well as glamping tents and a touring site for caravans and tents. Dogs – Well behaved dogs are welcome at Whitecliff Bay too. Guess which our caravan was?! 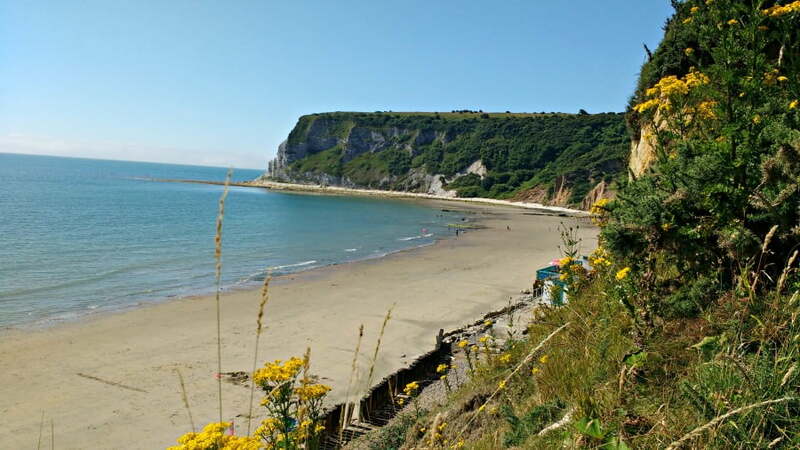 Whitecliff Bay Holiday Park is situated on the east side of the Isle of Wight close to Bembridge and the beaches at Shanklin and Sandown. It is about a 25 minute drive from Fishbourne where we arrived after catching the ferry from Portsmouth. Getting to the Isle of Wight is part of the holiday. We live in Yorkshire so had a 4.5 hour drive down to Portsmouth where we waited for our Wightlink ferry to Fishbourne. We arrived a little early for our sailing so had time for some shopping and food at Gunwharf Quays next door. The ferry to the Isle of Wight was great fun, and really added to the whole ‘going on holiday’ excitement. The journey was 45 minutes long across the Solent on a hot sunny Friday evening in July. The Americas Cup was taking place that weekend so there were yachts training in the Solent, and we could see the Isle Of Wight glistening in the distance as we got closer. 5 minutes after docking at Fishbourne, we were in the car heading off to Whitecliff Bay. 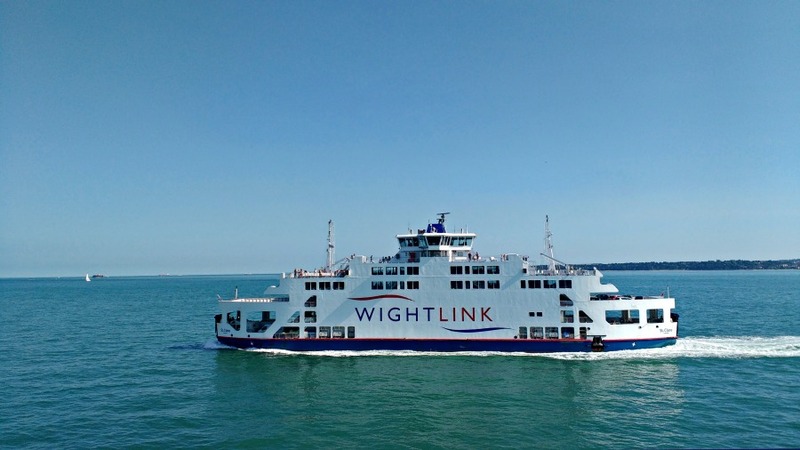 Top Tip – If you are visiting the Isle of Wight, ask your accommodation provider if they can give you a quote for the ferry travel too. Whitecliff Bay sorted ours out for us and it was considerably cheaper than if we had booked it directly. 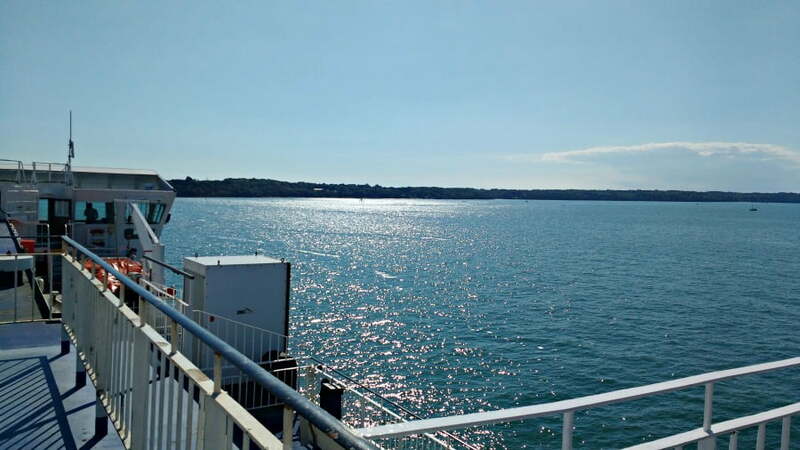 Top Tip – The Isle Of Wight Guru has a great Isle of Wight Ferry Beginner’s Guide, which is definitely worth a read if you want to get your head around the various options for getting to the Isle Of Wight. The boys loved the ferry journey to the Isle of Wight. Whitecliff Bay Holiday Park is lucky enough to have its own private beach, which in my opinion, is one of the best on the island. 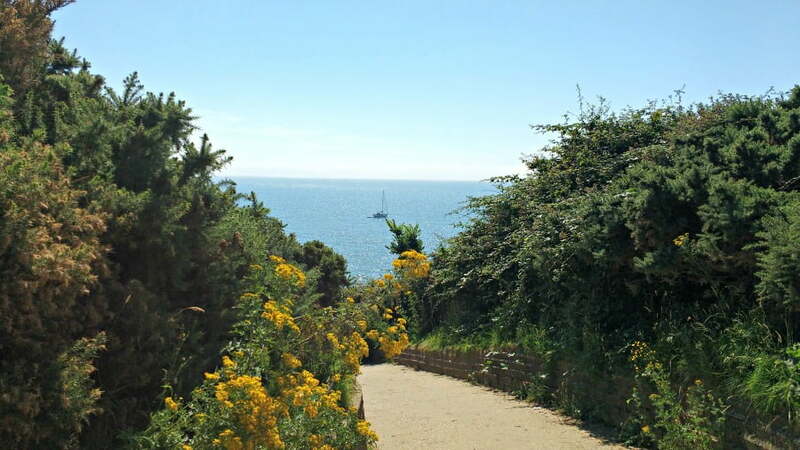 It is accessible from the holiday park via a steep path down from the cliffs which is perfectly accessible with a pushchair. Once you get to the beach, you will find a wide open bay with small waves lapping up against the beach. The beach is quite sheltered so the waves are quite gentle compared to other beaches on the island. The beach is made up of a mixture of shells and sands, and at low tide there are rockpools to explore. 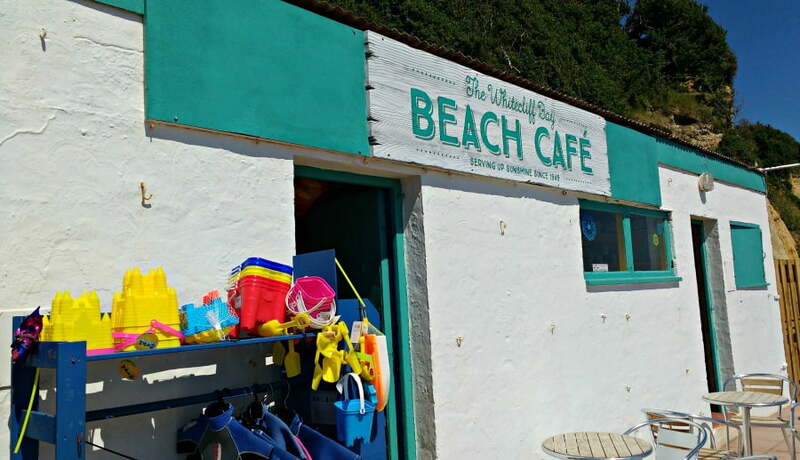 There are 2 beach cafes down at the beach – one of which sells buckets and spades, fishing nets, sun cream etc which is handy in case you forget anything. The only thing which is missing is toilets! There aren’t any down at the beach but there are some in the Nab Bar back up at the top of the hill. There are 2 outdoor playgrounds at Whitecliff Bay. One is in the centre of the holiday park, and is shaded with benches round the side for parents to sit on. The second one is in a large cliff top field just outside the Nab Bar which is one of the places you can choose the eat. 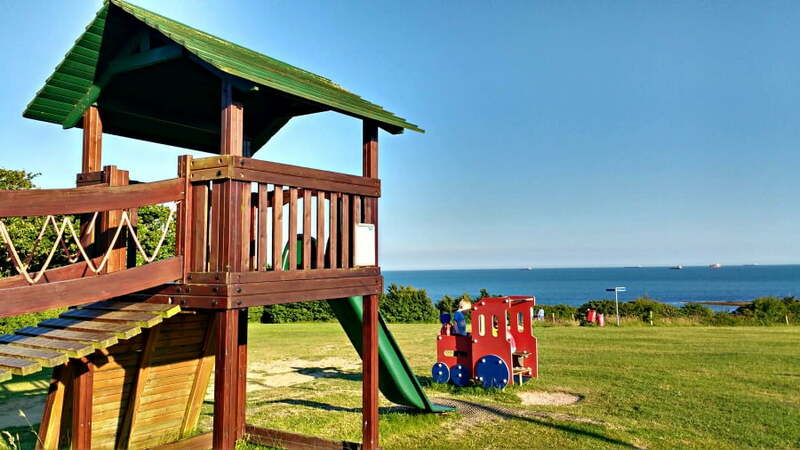 Little ones can play in the playground whilst you are waiting for your food and you can admire the sea views which are stunning. There is also an indoor soft play area which we didn’t use as the weather was so good that we were outside most of the time. There are 2 swimming pools at Whitecliff Bay. The outdoor swimming pool is in a wonderful spot with the sea in the distance, and surrounded by sunbeds. The pool itself is really big with a separate toddler pool. They operate a timed wrist band system to prevent the pool getting busy which is really important when swimming with babies and toddlers. Whilst we were there, one of the members of the Entertainments Team brought some squirty ducks down to the toddler pool which my toddler loved playing with. Top Tip – The outdoor swimming pool is open from 10am – 6pm most days. The pool gets busier in the afternoon so if you don’t want to wait to go in, try and arrive earlier. If you do have to wait like we did one day, just go and get a drink and an ice cream and watch everyone having fun. There is also an indoor swimming pool. We didn’t use this as the weather was so good so we swam outside. Guests arriving at Whitecliff Bay receive an Entertainment Planner containing details of all the activities taking place during their stay. When we were there, there was a Balanceability class for 3-5 year olds so they can learn how to ride a bike – cost £4. There was also a weekly free parent and toddler swim session in the indoor pool. The daily entertainment programme was jam packed throughout our stay. Each day there was one free Play activity such as Circus Skills, Nature Rangers, Spaghetti Art and Hand Foot Painting, which toddlers could take part it with adult supervision. There were also daily enhanced Play activities which guests have to pay for (aprox £4) and these included things like Edible Spaceships, Shaving Cream Marble Art and Pottery Painting. Toddlepops is a special afternoon show on the stage specifically for toddlers. In the summer months, there is an outdoor cinema with films such as Finding Nemo, but this started a little late for my 2. It would be great for families with older children though. If you can’t be bothered cooking, there are a number of places to eat onsite at Whitecliff Bay. The Nab Bar and Restaurant serves decent food and has plenty of outdoor seating so you can sit outside and enjoy the sea views. The Kid’s Menu costs £5.75 for 2 courses. Top Tip – I’d also recommend a meal at the Crab and Lobster Pub which is about a 5 mins drive from Whitecliff Bay. 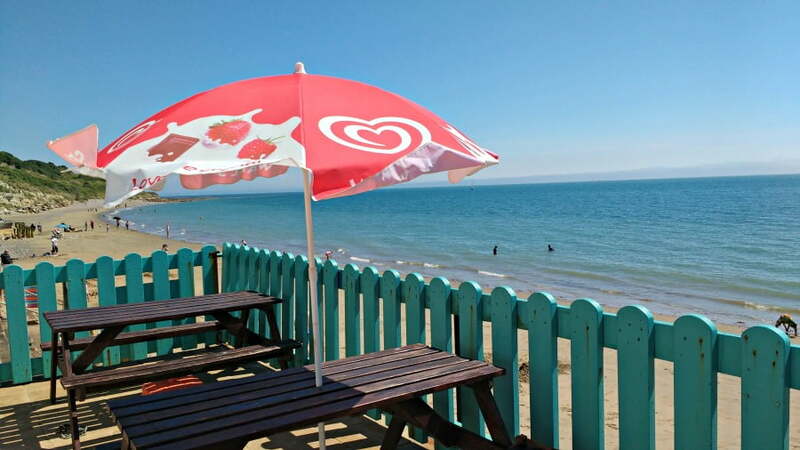 This cliff top pub serves fresh fish, burgers and pub favourites and has fantastic sea views. It’s a great place to go on a warm summer’s evening. There are SO many things to do on the Isle of Wight with toddlers – we spent a week there and didn’t manage to see and do everything. We had great days out at the Isle Of Wight Steam Train, Godshill Model Village, The Needles, The Garlic Farm and visited the beaches at Ventnor, Freshwater Bay, Shanklin and Sandown. 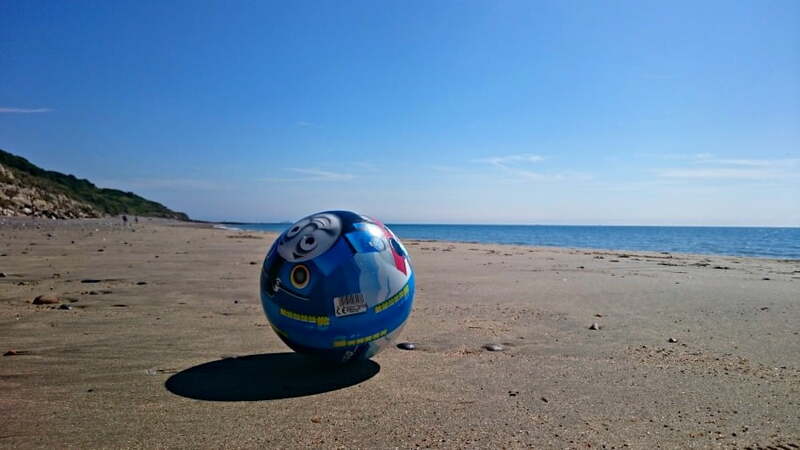 This ball came everywhere with us! Because the Isle of Wight is only 23 miles you can get anywhere in less than an hour. There is plenty to do if it rains as well and you can easily get over to the mainland for a day out at Portsmouth or Southampton.